To honor the-day-after-Thanksgiving, aka Black Friday, the unofficial holiday on which Americans celebrate retail commerce with a variety of odd rituals (gathering in Wal-Mart parking lots at 3am, grappling with strangers over reduced-price cashmere, et cetera), 6 Decades has prepared a brief catalog in which posters, advertisements, magazines, and records meet Pop, Op, Punk and Pictures at the intersection of art and commerce. Click the link above for the full listing. 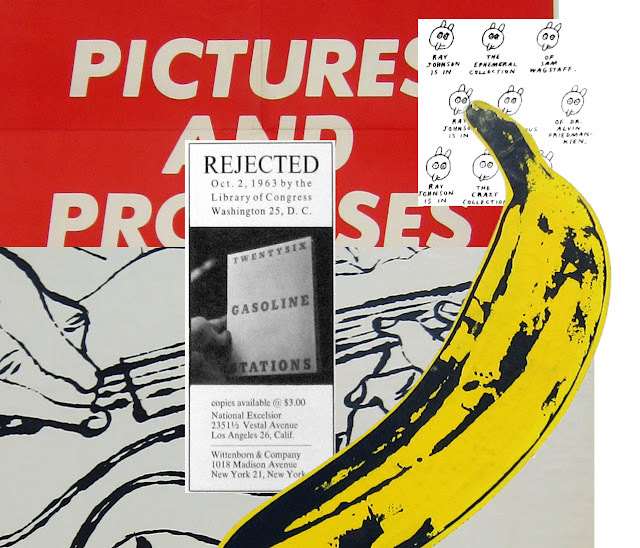 The catalog includes a poster from Barbara Kruger’s Pictures and Promises exhibition in 1981, four LPs designed by Andy Warhol, a complete run of Punk magazine (including two hard-to-find supplements), a poster each by Bridget Riley and Ray Johnson, and the advertisement Ruscha placed in Artforum to promote Twentysix Gasoline Stations.